St Thomas, the most developed of the United State Virgin Islands, is known for its duty-free shopping, magnificent yacht harbor, and its beautiful white sand beaches. Home to around 50,000 permanent residents, St Thomas combines the coziness of familiar US customs with island food, climate, and flair. Like the other US Virgin Islands (St Croix and St. John), St. Thomas was originally settled by Christopher Columbus and his crew. The Spanish, however, never left their mark on the island, concentrating their efforts elsewhere. As early as the mid-17th century, the islands were under Danish control. They created a flourishing sugar cane business and it was the Danes who created the distinctive architecture in the Virgin Islands and many of St Thomas' buildings date from the Danish period. By the late 19th century the sugar cane business in St. Thomas and neighboring islands was all but bankrupt. The United States, looking to create a strategic presence in the Caribbean from which to protect the new Panama Canal during World War I, purchased the three islands from Denmark in 1917 for $25 million. The Virgin Islands continue to be US territories, although today they have full home rule. The capital of St Thomas, named for the wife of the Danish King Christian V, is the shopping hub of the Caribbean. The pretty port city is easily recognizable by its white stucco buildings with red tile roofs and its sweeping downtown horseshoe-shaped harbor. The shopping area here, about a 15 square block area, is popular with cruise passengers and vacationers alike. Good values are common on such products as jewelry, linens, china and glassware, perfume, and liquor. US customs laws differ for purchases made in the US Virgin Islands. US residents may bring back $1200 in goods, including up to six bottles of liquor, duty-free. Vacationers staying on St. Thomas may wish to avoid the cruise passenger traffic that descends on the shops mid-day. One of the highlights on St. Thomas is Blackbeard's Castle, now a hotel of the same name. The tower there, which dates back to 1679, was originally built by the Danes as a lookout for the island. It is said, however, that Edward Teach, otherwise known as the pirate Blackbeard, took over the tower for his own nefarious purposes. Today, it offers one of the best views of the harbor, and visitors can sip a cocktail and watch all the activity along the waterfront and the town below. Consistently ranked as one of the top ten beaches in the world, Magen's Bay, on the north side of St. Thomas is a scenic and protected giant cove beach. Although known primarily for swimming and sunbathing, Magen's Bay also has a variety of underwater coral formations that provide excellent snorkeling. Changing pavilions, a snack bar, and sailboat, kayak, and paddleboat rental are available there. 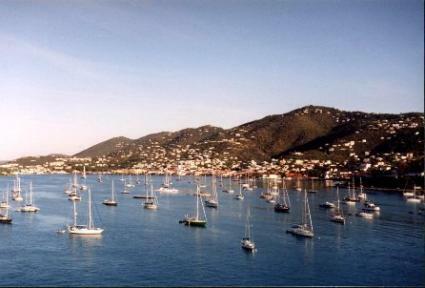 St Thomas is easily reached by plane, from Miami or New York, or via inter-island flights from San Juan, Puerto Rico and other Caribbean cities. Renting a car is advisable on St. Thomas, as taxis are relatively expensive and scarce. Be aware, however, that traffic flows on the left hand side of the road here. Accommodations range from luxury beachfront hotels to Creole-style bed and breakfast inns. All have a certain island flavor, but American standards of service and cleanliness are prevalent throughout the island. Food is varied and delicious. Although you can find a burger and fries, the local seafood and fish is freshly caught and combined with island fruits and vegetables makes a memorable meal. St Thomas is an American island getaway, just a two-hour flight from Miami. Don't be put off by the cruise traffic here. St Thomas is a lush tropical garden with interesting and varied history, beautiful beaches, and friendly people.